It’s here!!! 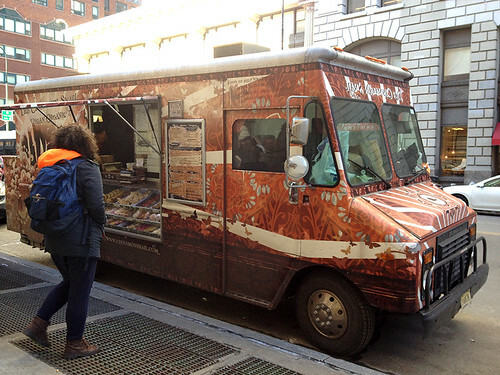 The Cinnamon Snail is back, reincarnated not as a food truck but a brick-and-mortar location! 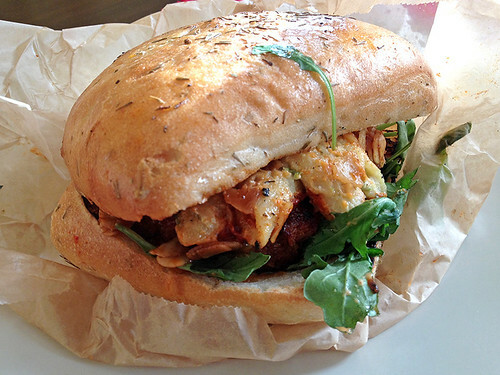 This is very similar to one of their daily specials which I reviewed last year (and loved! ), except now it’s on a pretzel bun instead of focaccia bread. And I am happy to confirm that it tastes just as amazing! 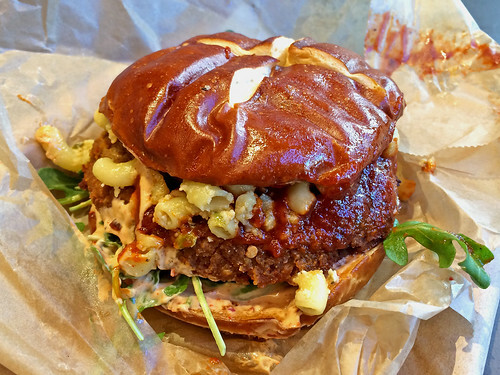 It might not be the most photogenic burger, simply because all that delicious vegan jalapeno mac and cheese is oozing out of it, and you know your fingers are going to be covered in barbecue sauce by the time you’re done eating it, but it is WORTH IT! The pretzel bun is a great choice – it tastes just like a pretzel, but the outside is as soft as the inside (it’s not too chewy or tough to bite through). 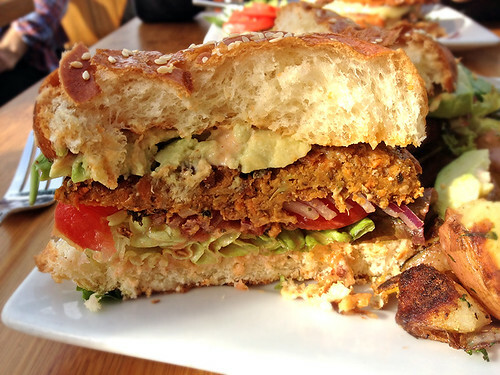 The seitan patty holds together perfectly (even when the toppings are oozing out of the burger) and has a nice hearty texture. It seems slightly spicier than I remember, so fair warning to anyone who is wary of a little heat in their food, but I really enjoyed it! 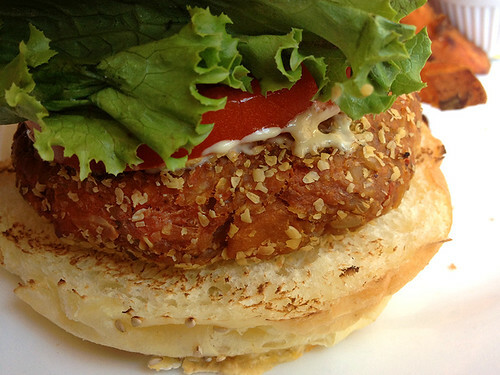 And the toppings… this burger is like the holy grail of perfect burger toppings! First: Maple bourbon barbecue sauce. I mean, you could stop right there and I’d already be drooling! But then on top of that, you get jalapeno vegan mac and cheese (brilliant! ), plus lovely fresh arugula, smoked chili coconut bacon (cruchy like dried coconut, smokey like bacon), AND chipotle mayo! 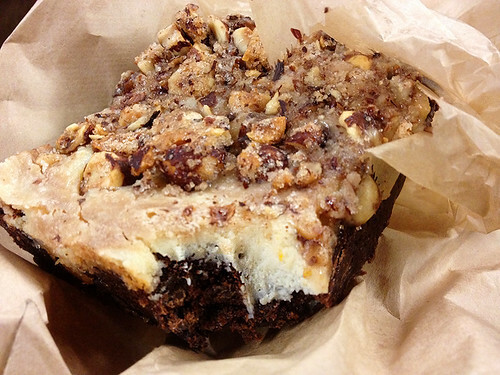 Pro tip: Make sure you grab a stack of napkins before you sit down to enjoy this heavenly creation. The Pennsy has a good amount of seating, so you can grab a seat at a nearby table to enjoy your Cinnamon Snail food right there, without having to carry it back to your home or your office or the steps of a nearby building (I love food trucks, but sometimes it is just so nice to have the convenience of a table and chairs when you’re eating lunch!). I came here at 2pm and it wasn’t too crowded, but I imagine lunchtime might get kind of crazy. 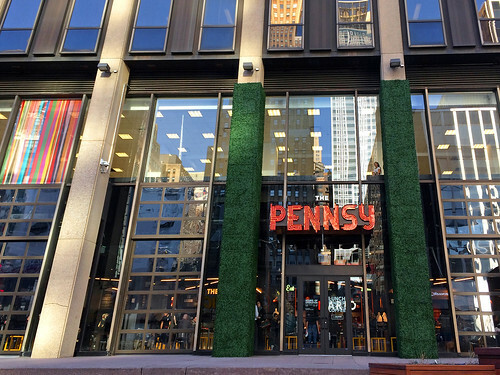 I’m glad I’m working in Manhattan this winter, because it will make it oh so easy to stop by the Pennsy to grab some donuts to take home with me after work. 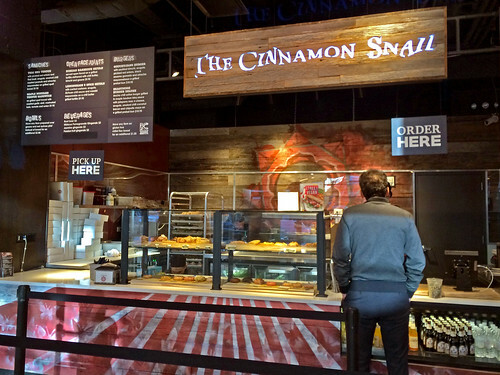 The Cinnamon Snail will be serving food until 11pm Monday through Saturday now! (closing at 8pm on Sundays). 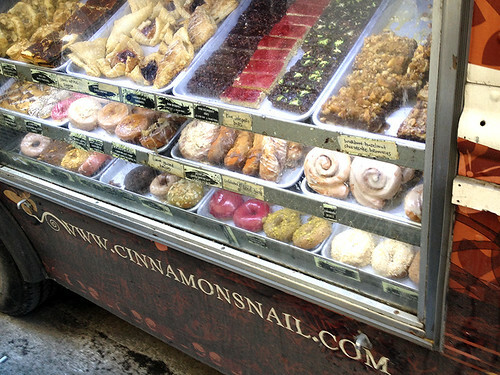 My new year's resolution is just to eat as many Cinnamon Snail donuts as I can... no shame! 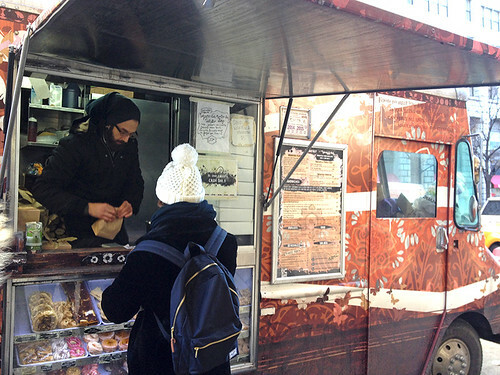 And as someone who travels by train quite often, I am very excited to be able to pick up lunch from the Cinnamon Snail before my next trip out of town! It's been awhile since my last blog post! 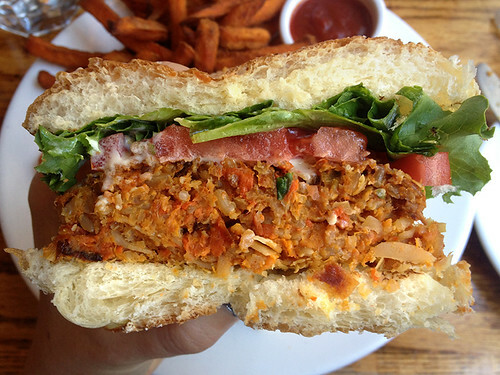 I've still been eating lots of veggie burgers (I have quite a few to share reviews of soon!) but this whole "life" thing has had me rather preoccupied... my day job, volunteer work, and oh yeah... I'm getting married! 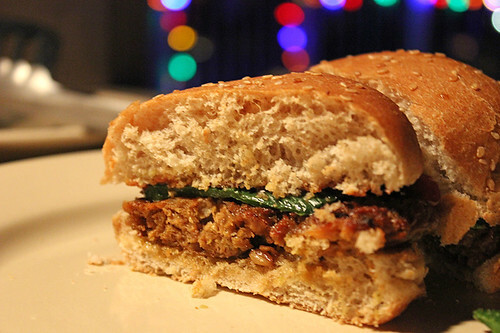 But in the midst of all that, I'm continuing my quest to keep reviewing veggie burgers! 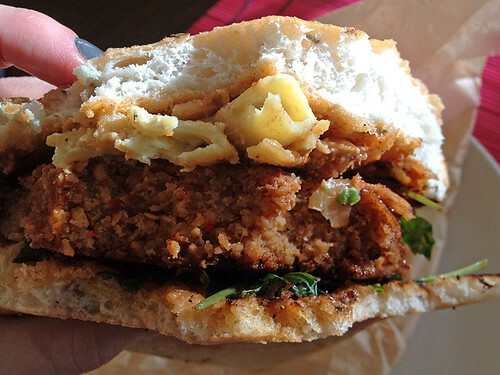 And today's review is a “veggie burger” unlike any I’ve reviewed thus far! 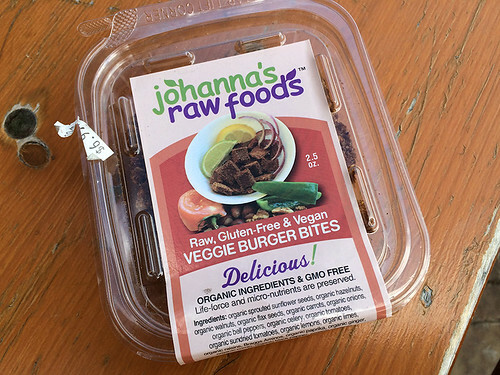 I saw Johanna’s Veggie Burger Bites on the shelf at my local health food store (I think my eyes are trained to immediately spot the phrase “veggie burger” anywhere I go). I was mystified, and a bit skeptical, of these strange dried-out looking bits of veggie burger… but I knew I had to try them. For science! And the blog! The texture was unusual. 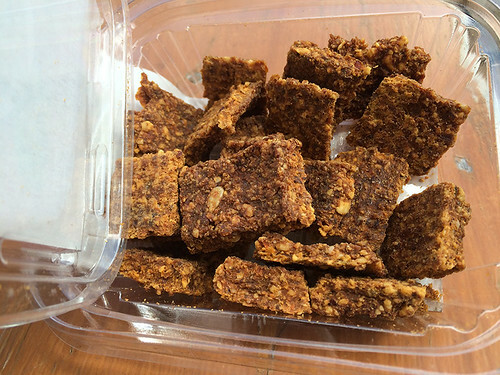 Looking at them, I thought they would be kind of crunchy like granola, but instead they were hard, (literally) like a dried out veggie burger, but not so hard that it was painful to bite into them or anything. Consisting of mostly nuts, seeds, and vegetables, the ingredient list certainly sounds like that of a veggie burger. The taste was unexpected – they reminded me of those vegan-cheese flavored kale chips that are sold in stores (the “nacho” flavor, I guess?). I like those kale chips, so I enjoyed the flavor of these veggie burger bites. They were a little spicy, with a nice kick to them. But I surprised myself by continuing to pop one after anther into my mouth! Soon I had finished the whole package. I wouldn’t say these remind me very much of veggie burgers, in appearance, texture, or taste… So it feels difficult to review them and rank them as such. Compared to other veggie burgers, they would be obviously be a disappointment. But on their own, they were an unexpectedly pleasant snack. 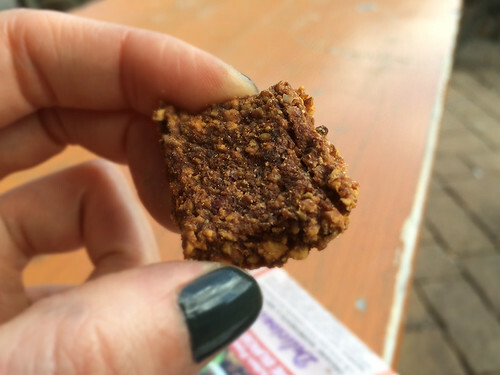 They’ve raw, vegan, and gluten free, so most of your dietary restrictions are covered, as long as you can eat nuts! I would certainly consider buying these again as a lightweight but protein-packed snack to bring along when hiking or camping. But don't try them expecting them to taste like the veggie burgers you are used to enjoying! 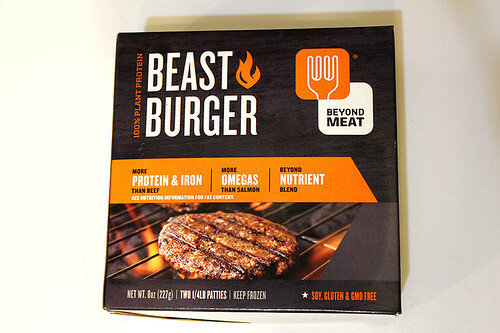 After hearing so much hype about Beyond Meat’s new “Beast Burger”, I had been stalking the frozen food aisles waiting for it to appear in NYC. 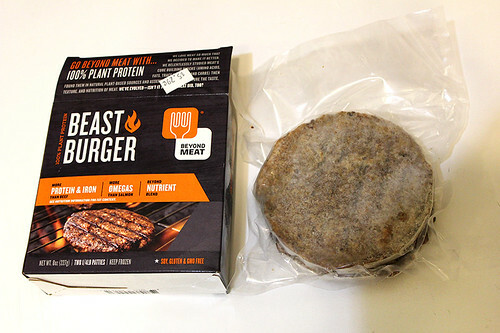 I really like Beyond Meat’s fake “chicken” strips, so I was excited to see what their take on a burger would be. 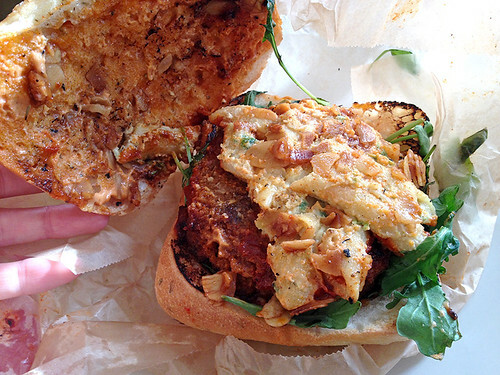 Finally, I found the Beast Burgers – just a few blocks from my new apartment in Astoria! At $5.29 for a pack of 2 patties, this is not the most economical frozen veggie burger patty available – but the patties are much larger than normal! 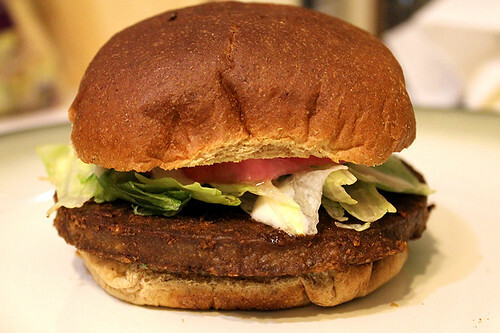 And Beyond Meat boasts that this vegan patty contains more protein and more iron than beef – so that’s pretty impressive, and maybe worth the extra cost. And they’re both gluten-free and soy-free. Seriously, I can’t emphasize enough how large these patties are – I had to pull out my biggest frying pan to fit two in side by side! I fried them in a little olive oil for about 8 minutes, flipping them a few times throughout. 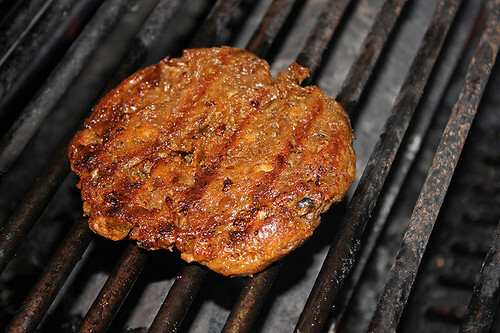 The patties come with “grill marks” on one side. For aesthetic reasons, I guess. Yup, so large that the patty was too big for my normal-sized hamburger buns! 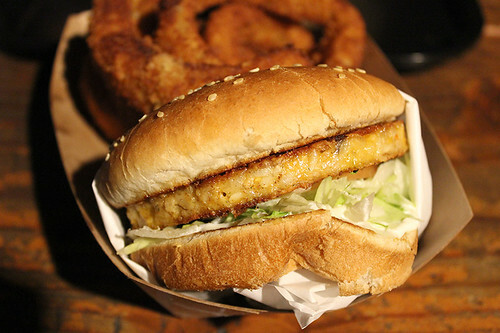 But that’s okay – the patty felt sturdy and at no risk for crumbling over the edges of the bun. You can see how it browned up after it cooked all the way through. I topped my burger with some lettuce, pickled red onions (my new homemade obsession – so easy, so delicious! Pickled onions will grace all of my burgers from now on!) and horseradish sauce (also a recent obsession, now that I’ve realized you can buy it at the store!). Biting into it, the first thing I noticed was the texture: It was pretty dense (packed with all that protein and nutrients? ), and obviously aiming for a meat-like feel. It’s been well over a decade since I last ate a burger made of beef, but I still don’t think this Beast Burger is an exact replica of that texture, as some reviews I read online have claimed. But it was still a little more dense and chewy than I would have liked. And despite my fears that it would be too oily after being fried in a pan, I thought it was a bit on the dry side as well. Luckily, the toppings I had put on it made up for that. Flavor-wise, I was surprised that it was kind of, well… bland. It tasted slightly “meaty”, not distinctly of any one flavor or seasoning, just a general protein-y, savory flavor. But I had hoped it would have more seasoning or some kind of kick of spice to it - but then, that’s something that can easily be remedied with toppings. 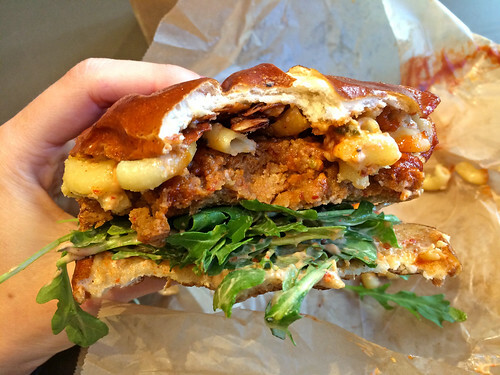 And people who don't like spicy things might prefer this burger. My boyfriend the omnivore was game to try the second patty I had cooked, and he actually ate the whole thing and said it was quite filling and he didn’t feel like he needed to go eat some meat afterwards (like some vegetarian meals make him feel) – but he did say that the taste and texture reminded him of “that one time that I ate a piece of cardboard”. (FYI, he has eaten other veggie burgers that he liked better! But usually the ones that aren’t trying to look and taste like meat). Ultimately, while I was not blown away by the Beast Burger, and while I may have had expectations that were a bit too high after reading all the hype online, this is still a very solid store-bought burger – definitely one of the best of the faux-meat varieties that are out there today. Not to mention all the health benefits that make it a better alternative to most other frozen veggie burgers in the grocery stores. I’d like to give these burgers a try on the barbecue grill too, although sadly since moving apartments I no longer have space to keep my own grill – so I’ll have to hope I get invited to a lot of barbecues this summer (hint, hint, NYC friends!). 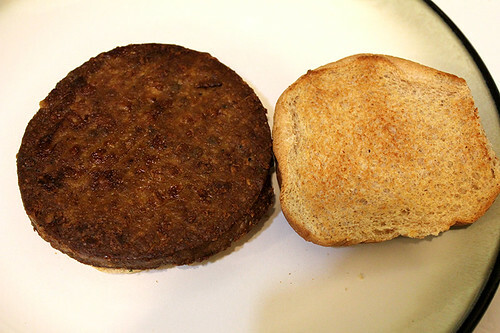 Beyond Meat also makes a smaller “slider” version of this burger, called “Beastly Sliders”. I have a box of those sitting in my freezer as well, so I’ll be giving them a try soon too! check Beyond Meat’s website to see where they may be sold near you. 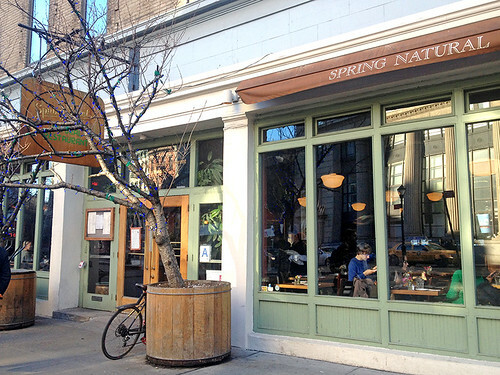 Spring Street Natural has become one of my go-to spots in Soho. 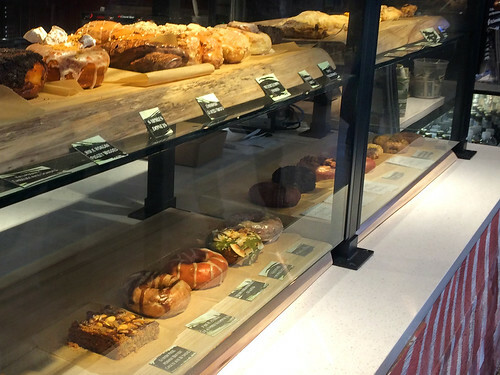 It has a lot of healthy, vegetarian options (as well as options for your omnivore friends), and it’s a huge restaurant so it’s rarely too crowded. 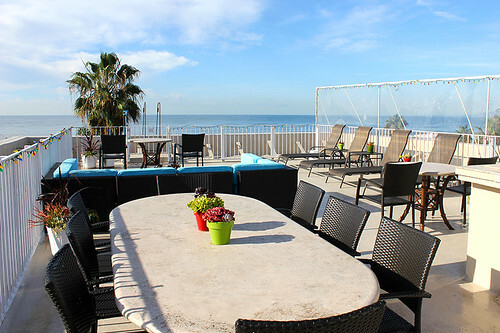 You can almost always get a table – yes, even at brunch on the weekends! 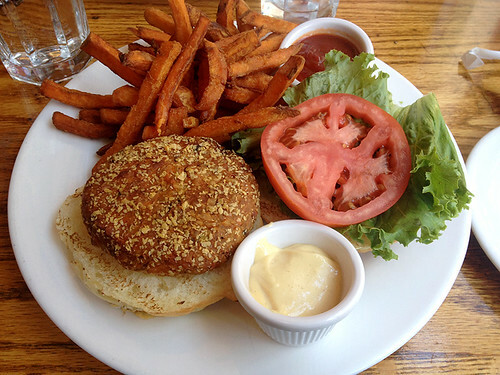 I had eaten here a few times before I finally tried the veggie burger – the menu said it was made in-house, and I was intrigued by the fact that it had almonds in it! The waiter told me that it would be completely vegan if I ordered it without the cheese (which I did) – but by default it comes topped with cheddar. The burger arrived topped with lettuce, tomato, and had a Dijon mayo (presumably not vegan, but double-check) served on the side. I tried a bit of the Dijon mayo on my burger, and although I’m not a big mustard fan, it added a nice note of flavor to the whole burger, since without the cheese there wasn't much in the way of toppings. The toasted sesame bun was soft and very fresh – I should add that Spring Street Natural always puts a small bread basket on the table at the beginning of the meal, and I’ve enjoyed every bit of bread I’ve eaten from this establishment. I probably ate some bread even before my burger arrived, if I recall correctly. I can't help it, I see a basket of bread slices and I just have to try them all! 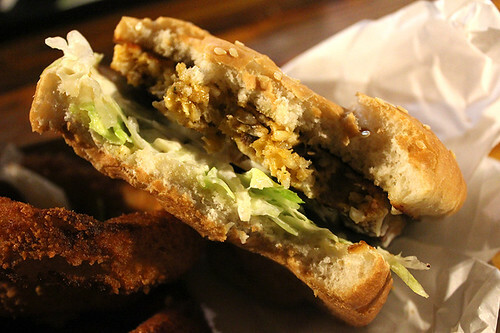 The patty itself was definitely house-made, and as you can see, packed full of veggies and grains. It was quite mushy, and although you can’t necessarily tell from the photos, lacked that nice crispy outside that I prefer on my burgers. Unfortunately, it was also a bit bland too. I was hoping for a stronger, more exciting flavor! I really didn't taste the almonds either. It wasn’t a bad burger, indeed it was quite hearty and filling and I couldn’t finish the whole thing (probably because of all that bread I ate at the start of the meal). But it just wasn't as good as I was expecting. Which is too bad, because some of the other vegetarian options on the menu here are really quite excellent! The sweet potato fries (included with the burger), however, were delicious! 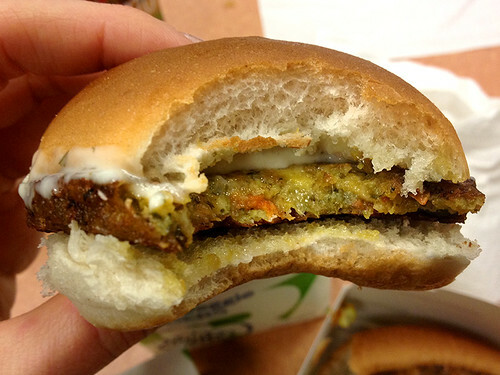 White Castle contacted me and sent me info and coupons for their new veggie sliders. But since I was out of town for most of December and then spent all of January apartment-hunting, packing, and moving into a new apartment, I did not get a chance to use the coupons before they expired. So I paid for the sliders I am reviewing here, and although I am grateful to White Castle for taking an interest in my little blog and offering me the opportunity to try their new menu items, the fact that they sent me a free apron and t-shirt won’t affect the honesty of my review (although the apron is quite useful in the kitchen – thank you, White Castle!). Walking into the restaurant, I noticed signs on each table advertising the new veggie sliders – which seemed like a good omen! But when I stepped up to the register to place my order, the cashier said “We don’t have any more veggie sliders”. 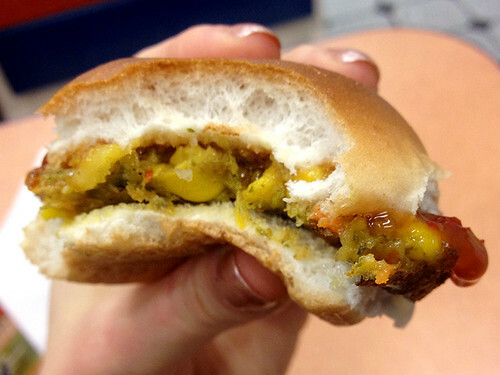 Disappointing, but maybe it was a good thing if the veggie sliders were so popular they were selling out? 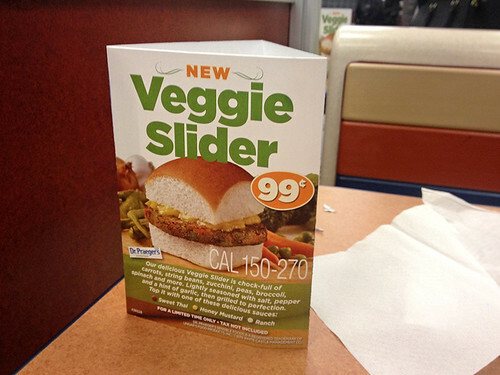 Hopefully that would show White Castle executives that having a veggie option was a smart move! So I asked the cashier when they would have the sliders back in stock so I could return to try them. To my surprise, she said they did have them in stock, but “No one is cooking them, so it would take about 10 minutes”. Confused, I tried to clarify: “So, if I wait ten minutes, can I order them?” The cashier seemed shocked that anyone would want to wait 10 minutes, but agreed to take my order, and called back into the kitchen for someone to start cooking veggie sliders. I was baffled – so they did have the sliders, they just couldn’t be bothered to prepare them for their customers? White Castle had told me that they were training their employees to cook the veggie patties separately from hamburger patties, even using different-colored spatula to keep them separate! But I hadn't anticipated that this would mean it would be such an ordeal to order them. Oh well… at least they would be freshly-cooked! But I was troubled that the cashier had not given me this information when I first asked to order the sliders. She had simply said “we don’t have any more veggie sliders”. If I had not been persistent and asked a follow up question, I would have left the restaurant assuming they were out of stock. In fact, I had seen a customer in front of me leave after hearing something he wanted was out of stock – I had missed the beginning of his conversation with the cashier, but now I would be willing to bet he’d tried to order the veggie sliders too, and been turned away! They were tiny, and kind of cute – each in its own little cardboard case. 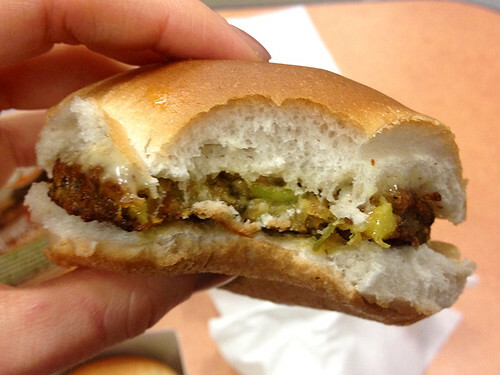 The patties are all Dr. Praeger’s vegan veggie burgers – a mix of carrots, zucchini peas, spinach, and broccoli. I haven’t been too impressed by Dr. Praeger’s burgers in the past, but I have to say, maybe it was the 20 minute wait, but these did not seem too bad. They were a bit mushy, but they were warm and held together well! The Sweet Thai sauce is the only one of the three flavors that is vegan. It was a nice sweet-sour flavor, very mild compared to some sweet Thai sauces I’ve tried. I wished there were some peppers or greens with the patty, but I guess the whole deal with White Castle’s sliders is that they’re rather minimalist? This sauce contains eggs, but no dairy. I’m not a big mustard fan, but I actually kind of liked it (I guess because it was more sweet than mustard). It seemed like there was a smaller portion of it than there had been of the Sweet Thai sauce, but I was glad the mustard flavor wasn’t too overwhelming. 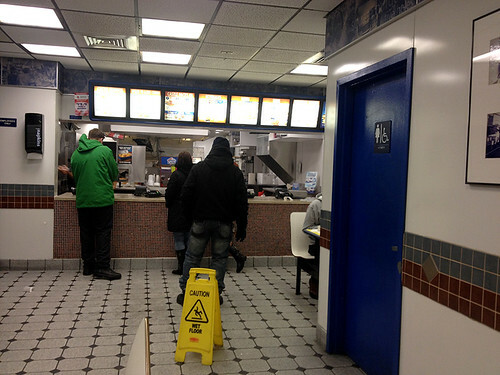 This White Castle location, near the Port Authority, is hardly a place I’d be in a hurry to return to (it was quite possibly one of the dirtiest restaurants I’ve ever eaten in). But if you are nearby, hungry, and low on cash – or your intoxicated omnivore friends drag you with them on a quest for sliders – at least there is now a vegetarian option here. 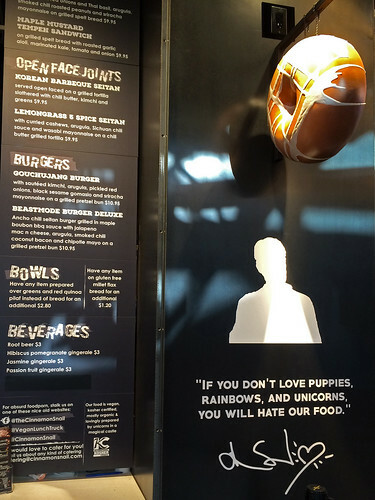 And I am totally in support of every restaurant, even fast food chains, having those options for their customers! 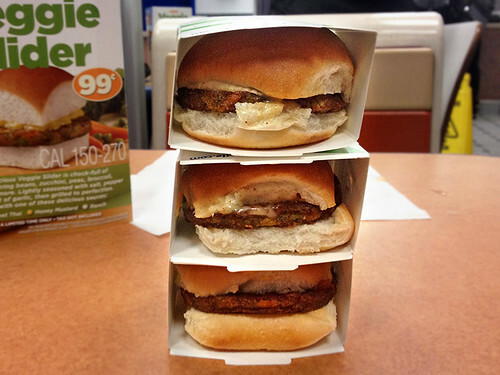 But all of White Castle’s corporate promotion and advertising of the new veggie sliders seems to be at odds with the staff’s attitude towards them. I should add that it was well into lunchtime (1:30pm) when I arrived. If they didn’t have anyone cooking veggie sliders by then, would they have ever gotten around to cooking them that day, if I had not insisted on ordering them? And does this happen every day? How is White Castle supposed to evaluate if there is enough demand to keep these on the menu if they are turning away customers who try to order them??? 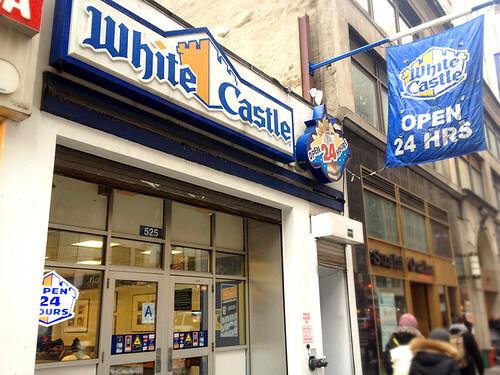 I hope this is just an issue at this one White Castle location – has anyone tried to order the sliders at a White Castle outside of NYC? Or have you been to the NYC one and had better luck than I did? I had been stalking the vegan foods section of Whole Foods for weeks looking for these, but finally found them at a local natural food store in my neighborhood. 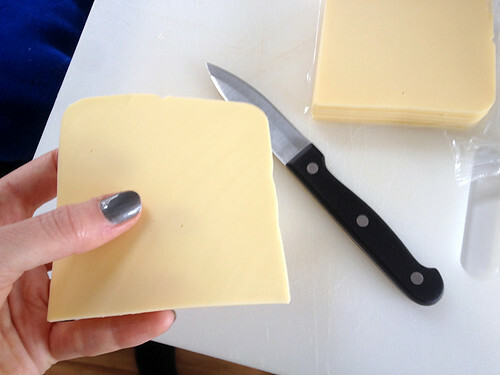 The Chao slices are sealed in one package together, but surprisingly come apart easily without sticking to each other. This is one of those rare vegan cheeses which tastes good plain! I ate some slices on their own, and then a few on crackers. 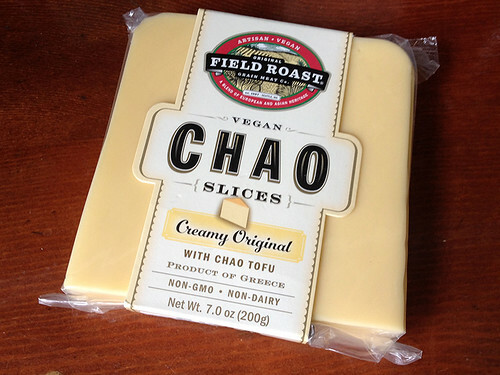 One evening after a friend and I finished a bottle of wine, I drunkenly ate several chao slices, and they were just the perfect craving-satisfier at that moment! So this product should definitely be included when you have a vegan wine and cheese party. 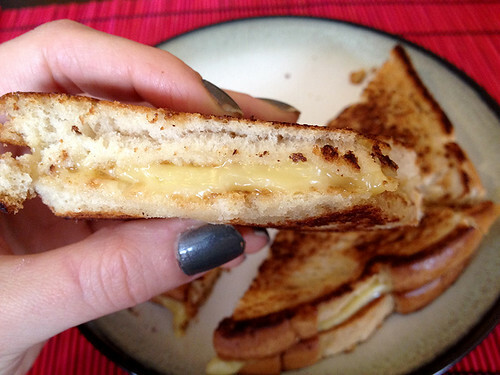 Of course, the real test for this vegan cheese was the grilled cheese sandwich. 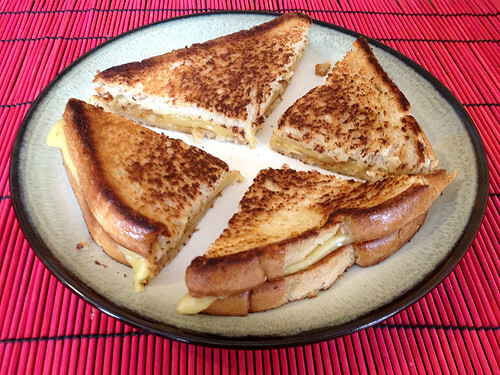 It did seem to take a bit longer to melt than other vegan cheeses, but it was worth it - so yummy! Perfect comfort food on these cold winter days! I can't wait to try the other flavors once I am able to locate them in stores... especially the spicy tomato cayenne pepper one! And you can bet I will be putting these slices on my veggie burgers quite often from now on! 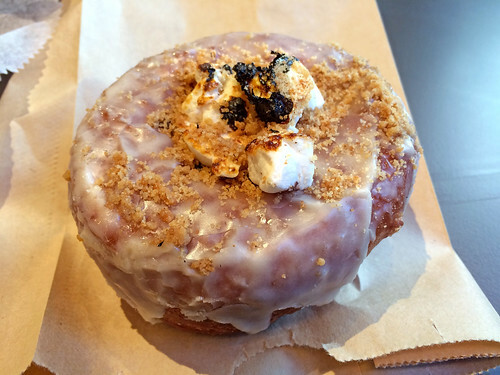 Check Field Roast's website to see where else they might be sold. 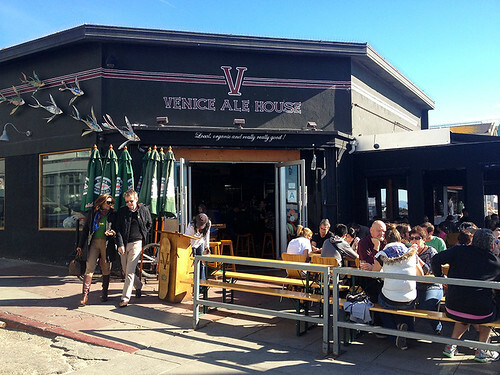 Venice Ale House was just down the street from the hotel we stayed at in Venice Beach, and with its outdoor seating looking out onto the beach, we couldn’t resist stopping here for brunch one afternoon. I had already seen a few vegan items on the menu before I spotted the veggie burger, but once I saw that it was called “The Mother Trucker Veggie Burger” I laughed and knew I had to try it! Yes, that’s a huge sprig of rosemary sticking out of a really deliciously tasty bun (soft and sweet, studded with sesame seeds). 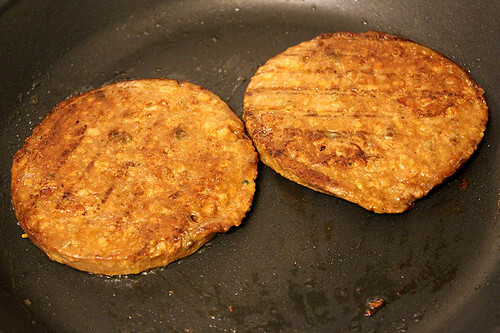 The patty could stand to be a little less mushy – the texture ended up feeling like a thick paste in my mouth – but the flavor was excellent! In particular, I enjoyed the spicy kick that hits you after the first bite! The standard toppings the burger came with were lettuce, tomato, raw red onion (ehh, I think I’ve expressed my dislike of raw onion on burgers before) and chipotle aioli (although the staff said the burger was vegan, I’m guessing they were not thinking about the aioli). Because I was on vacation, I splurged and spent an extra dollar for avocado as well. Mushiness of the patty aside, taste-wise, this was one of the better burgers I had on this trip! And the roasted potatoes it was served with were quite enjoyable as well. I wish we could have stayed longer, because I would have been glad to come back and try one of the vegan breakfast scrambles on the menu too. Wow, January was a busy month! 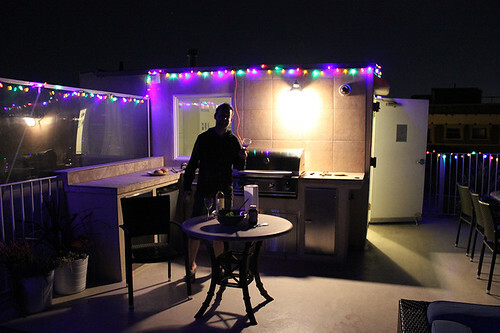 I moved into a new apartment, and am still unpacking… which explains why I have still not finished posting all of my veggie burger reviews from my trip to Los Angeles back in December! 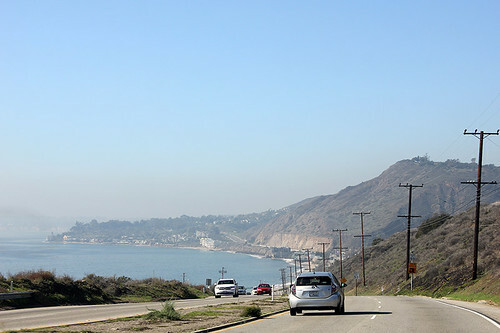 One of the best parts of our L.A. vacation was driving up the coast for beach days in Malibu. One evening, after watching a beautiful sunset, we realized we were starving, and the closest place was a seafood restaurant called Neptune’s Net. Hopeful that I would find something there that I could eat, we ventured inside. 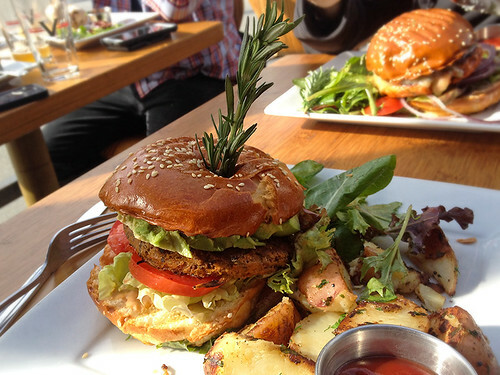 Lo and behold, one of the few vegetarian items on the menu was a “garden burger”! They could not tell me if it was vegan or not, so I’d err on the side of caution and assume it’s only vegetarian, as many pre-made patties unfortunately are (and some of the yelp reviews sound pretty certain that it’s not vegan). It was pretty simple, just some shredded iceburg lettuce, a pale tomato slice, and a generous serving of mayo, all on a very standard, squishy, fast-food-esque bun studded with sesame seeds on top. The patty itself wasn’t bad. A rather standard “garden burger”, it was fried well, and maybe I was just hungry, but it even tasted pretty decent for a pre-made patty! It was more of a vegetable mash than faux-meat texture. I was trying to figure out if it was a brand I had tried before, but couldn’t quite place it. 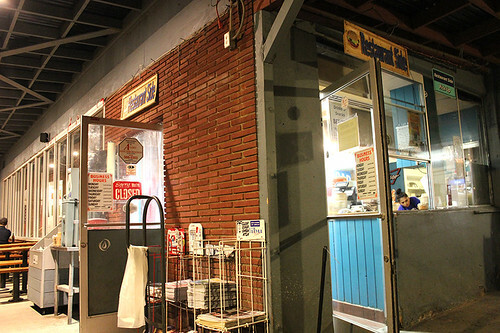 Overall, not a great veggie burger – but after a day on the beach, if you’re a starving vegetarian and just need something in your stomach, at least Neptune’s Net offers that! This probably officially makes me a dork, but one of the things I was looking forward to as I planned my visit to Los Angeles was not just the new veggie burgers I could try in local restaurants, but the possibility of new veggie burgers at the grocery stores as well. 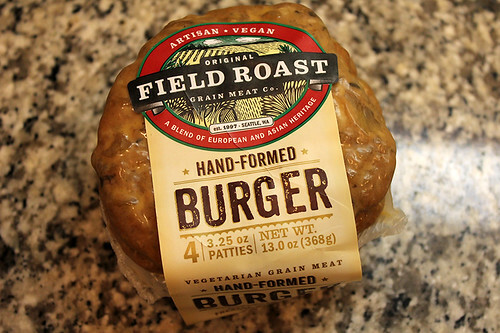 I’ve been wanting to try Field Roast’s veggie burgers for ages (I stalk them on facebook) because I love their vegan sausages so much. But, alas, I have been unable to find them in New York! I’ve checked multiple Whole Foods locations and numerous local natural food stores, but it seems they have just not made it to the Big Apple yet. So I was thrilled to find them at a Whole Foods in California! At $8.99 for a pack of four, they were a bit pricy, but I was so excited to try them that I figured the price would be worth it. Eager to finally taste them, I didn’t even wait for lunch or dinner – I fried one up for breakfast the next morning. I was a bit dubious about the look of the patty as I dropped it into the frying pan (but I guess that’s the “hand-formed” shape the packaging advertised?) and they seemed thinner than I was expecting a good, hearty burger to be (they come with all four smashed together in the package and you kind of have to peel them off of each other). And I was unfortunately kind of disappointed with the result when I tasted my breakfast burger patty. There were some good flavors in it, but it was super oily. I had fried it in a tiny bit of butter, but it seemed like the patty had plenty of oils in it already, and by the time it was cooked up it was extremely greasy. The texture was pretty good though – a bit like the Field Roast sausages, but different (heartier, and… meatier?). 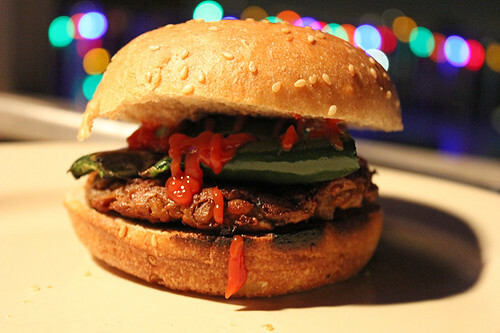 …and it turns out, these might be the BEST veggie burgers EVER for cooking on a barbecue grill! 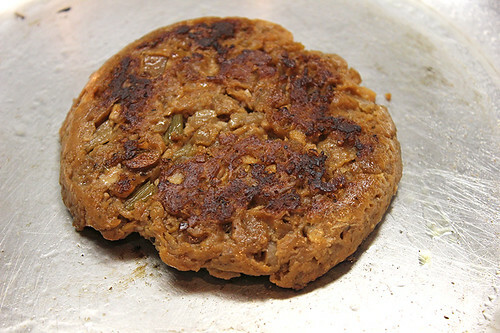 It cooked perfectly, heating up all the way through and getting nice char marks from the grill, while never sticking or falling apart (a flaw of many other veggie burgers). I was amazed! DELICIOUS! It seemed that grilling was the secret to success with these patties. It no longer tasted too oily, and the texture was perfect. 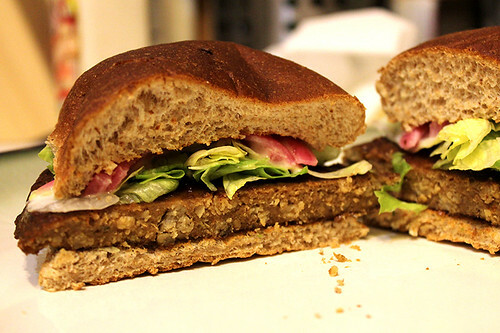 The flavor was rich and hearty – they’re made with barley, carrots, and celery, and you could see bits of the actual vegetables in the patty, yet the seitan base of the patty held it all together so well. Paired with some roasted habanero peppers and a toasted bun, it was a perfect burger! I was so happy that my first impression of these burgers turned out to be wrong. Maybe there is a way to cook them in a frying pan that works better than the method I used, but I think these burgers are designed and destined for the barbecue grill. 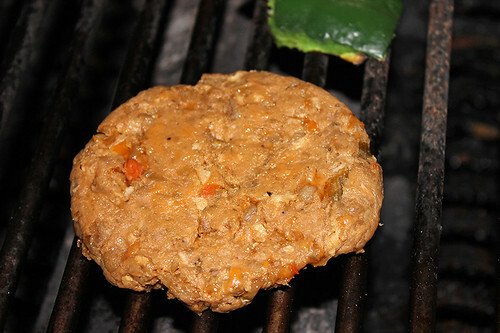 And if you have ever been frustrated by veggie burger failures on the grill, you should definitely try these! They will change your life! And they’re vegan, so everyone can enjoy them (unless you can’t eat gluten, then you’re out of luck with these). 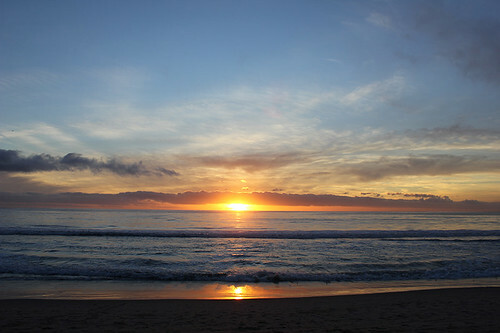 Or, you know, you could just fly out to L.A. – it’s a pretty cool city, afterall!